AVG Internet Security 2014 ($55 for one year of protection on one computer) is a decent security suite that gives adequate protection and adds little weight to your system. In our real-world testing scenario, the suite protected against 98 percent of all unknown (zero-day) attacks. It did an even better job of protecting against known malware, repelling 99 percent of those attacks. Still, half of the ten security suites in our roundup blocked 100 percent of zero-day threats, and all but three blocked 100 percent of known malware attacks. AVG did well in our usability tests, not flagging any legitimate software or websites as dangerous. With a performance score of 3, it adds very little drag to your system. AVG’s installation process asks you to choose a language, agree to license terms, enter your product key, and choose an express or custom install before getting down to business. It doesn’t ask to install any extra software (such as toolbars or browsers) or to change any settings (such as your homepage), however, so you should be able to click through these screens in a matter of seconds. AVG's advanced settings menu is definitely for advanced users. 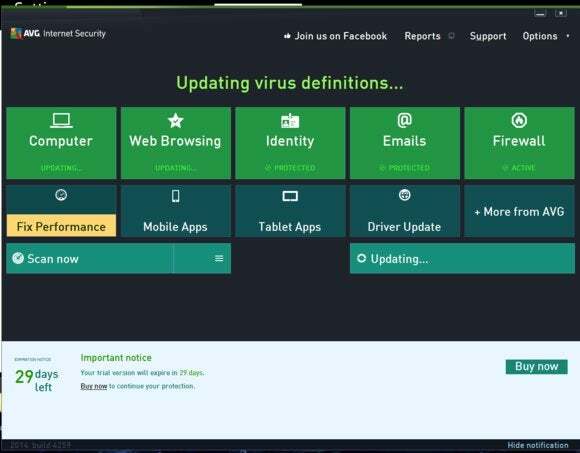 Compared to the other security suites in our roundup, AVG’s main screen looks a little cluttered. At the top of the screen it displays a large banner that’s green if you’re fully protected and red if you’re not. Under this banner are five large green tiles: Computer, Web Browsing, Identity, Emails, and Firewall. Each tile displays a warning if you are not secure. Below this first line of tiles are five more tiles, slightly smaller and in teal: Fix Performance, Mobile Apps, Tablet Apps, Driver Update, and More from AVG. Two more tiles, in light teal, appear beneath those, containing buttons for scanning your system and checking for updates. Finally, the bottom of the screen hosts a white banner that lets you know how many days of protection you have left, depending on your subscription status. This array of tiles makes AVG’s main screen seem a little overwhelming, and there’s no quick and easy way to get to the settings menu, either. The Advanced Settings area, which isn’t touchscreen-friendly, is indeed mostly for advanced users. AVG provides very few jargon-free explanations of its various settings. AVG Internet Security 2014 offers good protection, but it’s perhaps most suitable for power users who want a lot of advanced options at their fingertips. AVG's suite offers good protection, but its many advanced options render it most suitable for power users.